Yesterday officially marked the first day of summer! While this means fun and exciting things for most people, it also means lots of insects will be hanging around. Learn about five common insects that you might see this summer and how to keep them away from your home! What attracts them: Any type of food such nuts, fruit, and sweets. Where they are usually found: As you may already know, ants can be found anywhere and everywhere. How to get rid of them: To keep ants from coming into your home, it’s best to find and seal off any entry points that they are using. Caulk or petroleum jelly work well to seal these entrances. You can also use methods of repelling them such as ant traps and commercial ant repellents. For a more natural route, things such as cinnamon, garlic, coffee grinds, and paprika work well to repel ants. These can be sprinkled at the entry points to keep ants from entering your home. 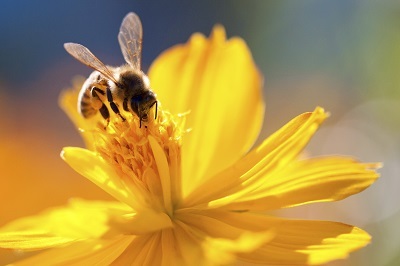 What attracts them: Bees love pollen so they will hang around flowers and gardens. Bees and wasps also love sweet things, so if you have any fruit growing nearby or are eating something sweet outside you can expect to see these critters. Where they are usually found: Bees and wasps tend to stay in temperate climates. You can find their nests in trees or in structures such as barns, attics, etc. How to get rid of them: You can’t stop these critters from coming by every now and then, but to prevent them from staying you’ll have to get rid of any nests near your home. The best way to do this is to wait for the queen bee to leave, then fill the nest with dirt to prevent a new queen bee from coming. You can also use commercial sprays and traps to keep bees or wasps from staying near your home. How to get rid of them: To keep flies away, make sure any garbage is cleaned up and taken out. Having screens on your windows and doors is also a good way to make sure these pest can’t easily enter your home. What attracts them: Female mosquitoes like to bite humans and animals, while the males will go after nectar in flowers. Wet climates will also attract them, since that is where they they like to lay their eggs. Where they are usually found: Near lakes, ponds, swamps, and any other areas with water. How to get rid of them: Drain any standing water near your home to prevent mosquitoes from breeding. What attracts them: Ticks like to latch onto a host so any humans or animals will attract these pests. Where they are usually found: Wooded areas and in shrubs or tall grasses. How to get rid of them: Keep your lawn and any shrubs trimmed short. Ticks won’t enter homes by themselves, and they usually get in by attaching themselves to people. Avoid this by wearing long pants when outside in areas where they might be, and also do a tick inspection before going back inside. (You can read more about tick prevention in our past article here). Want to get the full list of common insects? Read about more here! Don’t let insects ruin your summer fun! Download our FREE insect guide to learn about how you can keep you yard insect-free this summer. Click below to get your copy now!